Getting your nails done is a lot of fun, but why spend $$$ in the salon when you can apply your own fake acrylic nails at home? I'm absolutely hopeless with painting my own nails, so stick-ons give me the look I want without the hassle. 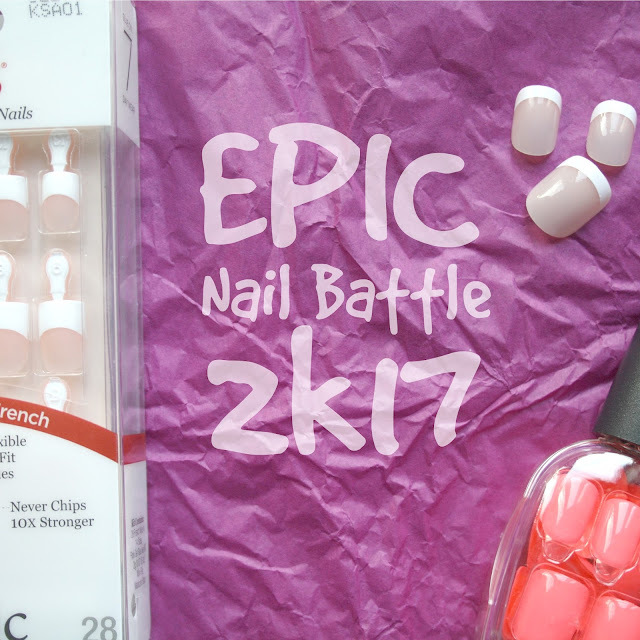 Today I'm reviewing three nail brands - which will come out on top in my epic nail battle?! Price: £8.99 per pack in Boots, the most expensive option that I'm reviewing. Ease of Application: By far the easiest application process that I tested! Instead of using glue, you simply peel off the strip on the back of the nails and press them on. There was absolutely no mess and it took hardly any time at all! Ease of Removal: Also the easiest removal process - you could pull off these nails without hurting yourself, no need for acetone! Look: Super sleek and glamorous! I wore these nails to a winter ball and felt like a princess! The packaging is also adorable, the nails are presented inside a nail polish bottle! Love it! Practicality: These were slightly on the long side, meaning that I had to spend a little while getting used to texting in them! Longevity: These lasted over a week without any trouble, no re-applications needed! Most importantly, are they Instagram-worthy? Price: £7.95 per pack in Boots. Ease of Application: The little tabs at the top of the Kiss nails, which you then break off once you've applied the nail, are a godsend for lining up these bad boys correctly. Ease of Removal: DO NOT try to pull these off, it hurts! The only way to remove them is by soaking them in acetone. It smells gross and takes ages, but it's definitely the best way. Look: These look almost indistinguishable from the Make Up Gallery nails below - they seem fairly natural and give a polished and refined look. If anything, they are slightly chunkier than the Make Up Gallery set. Practicality: The nails that I wore were of the Real Short length, which was perfect for me. They gave a great look without impacting my ability to type or text. Longevity: These lasted fairly well. After about five days, a few began to pop off. Price: These will set you back just £1 from Poundland - score! Ease of Application: Relatively easy to apply. You use the glue that is included to apply the nail, then press and hold to keep them in place. Out of all the sets I tested, you have to hold these nails on for the longest time - this glue is the weakest of the lot. Ease of Removal: Again, these have to be soaked in acetone for proper removal. The process smells nasty and takes a while. Look: The simple French nails look super natural and I had a lot of compliments when wearing them, lots of people couldn't believe they were stick-on. Practicality: The nails are quite long and I found them slightly awkward to type with for a start, but I soon got used to them. Longevity: These didn't last all that long, some of the nails popped off on the same day that I applied them. Re-applications were necessary. What are your favourite false nails to wear? Have you tried any of these brands? Leave a comment below!